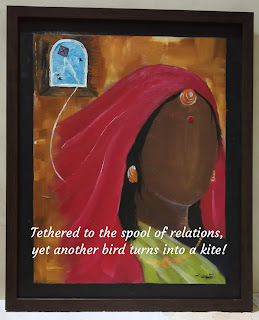 Tethered to the spool of relations, yet another bird turns into a kite! Writing after a long time. Gazing out the window, was never so hurting before - disturbance that well the eyes and the heart roars, a song of melancholy hums from within - - no drop of hope the cloud gets; that could touch the skin. 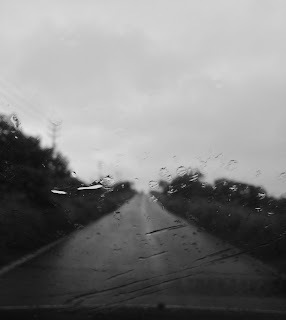 Watching patterns of clouds in puddles was fun before, tarred roads reflected on clouds today, making it look sore. Wish of a selfish me, was to see the crying clouds, I hoped to see the hope that wished me luck aloud. ... and then the drops poured down, in a gush to wet the ground, a melting heart, emotions drenched, dry me, but wet surround. I get to the edge, open windows, and allow the water in, the body soaked and so the mind, in world of feelings akin - - Moist soil brings to me memories of the days bygone, for some time now, solitude is where I found the cozy zone. I believe clouds wished the same for me, water trickle down my eyes, Earth rejoice the moments of now, while I celebrate past. and to slowly part with life. but she offered only thorns!